I love whoopie pies. They bring me back to the days of recess and Little Debbie, except these are much better than anything you’ll find in cellophane. This lightly sweetened treat makes the most of winter’s last root vegetables and citrus, and also incorporates another local ingredient – maple syrup. No sugar in this recipe. This is a great carrot cake recipe, even if you don’t want to make whoopie pies. Just skip step 4 (and the assembly, obviously) and bake for 40 – 50 minutes at 350. Also, if you can’t find marsacapone, whipped cream cheese will work just fine. And if you don’t feel like making your own whipped cream,you can use store bought. 1. Place the oil and the maple syrup in a bowl and beat for a minute or two. 2. Gradually beat in the eggs. Add the yogurt and beat a bit more. 3. Sift together the flour, baking soda, baking powder and spices, then beat into the other ingredients. Finally, add in the carrots and mix til combined. 4. Pour the batter into a baking pan and place in the freezer for atleast 30 minutes and up to 2 hours. 5. When the batter is cold, preheat the oven to 350. Using an ice cream scoop, drop the batter onto a greased baking sheet, spacing the cookies atleast three inches apart. If you don’t have an ice cream scoop, use two tablespoons of batter. 6. Bake the cookies for 12 – 15 minutes, until puffed and golden, or until a toothpick inserted into the center of the cake comes out clean. 7. Remove cookies from the oven and cool for 5 minutes before moving to a wire rack and cooling completely. 8. While the cookies are cooling, combine the marscapone, maple syrup, lemon juice and zest in the bowl of a stand mixer fitted with the whisk attachment. Mix til smooth. With the mixer still running, slowly pour in the cream and whisk until the cream holds steady peaks. Do not over whip! This can also be done with a normal whisk, if you don’t have a stand mixer. 9. 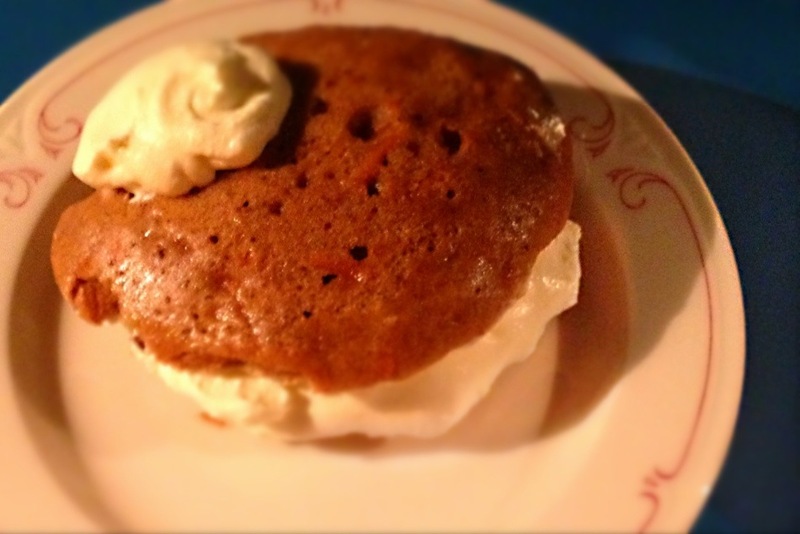 To assemble the whoopie pies, flip over a carrot cake cookie and place a dollop of frosting into the center. Top with another cookie and press gently to spread the frosting to the edges. Repeat with the remaining cookies and frosting. Arrange the pies on a serving platter and serve. Refrigerate leftover cookies.